It’s fairly uncommon to hear of a cat in need months before their arrival. 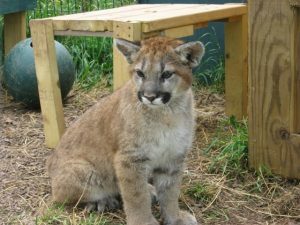 We first heard of orphaned wild-born cougar Andre in late summer of 2009 when he was being cared for by Critter Care Wildlife in British Columbia. His story was so sad, found alone on a road, we had to try to make it right for him. Andre’s arrival would turn out to be exciting news for another cat, too. 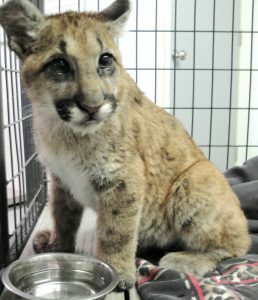 Donoma, a wild-born cougar already rescued by The Wildcat Sanctuary, had always wanted to live with another cougar. Unfortunately, none of the current cougars would accept him. Would he and Andre get along? Then, another unexpected call came in. 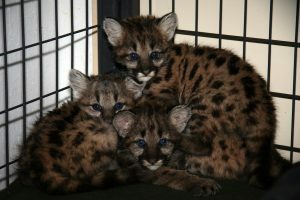 Five more wild-born cougar cubs needed a home. Working with another facility in Minnesota, TWS decided to accommodate 3 of the 5, while the other facility took in the other 2. The goal would be for these 3, Carlo, Noah, and Langley, to live together with Andre and Donoma as a blended family. Andre was flown from British Columbia to Chicago where caretakers drove to pick him up. He was so quiet in his crate. It was hard to believe a cougar was in there. It wasn’t until stopping for water for him that we saw his precious face. The most wonderful thing happened when one of the caretakers made a chirp noise, Andre responded with his own chirp. For the caretakers it was love at first chirp. Andre was a handful from the beginning! One of his favorite things to do was a ‘sneak attack’ to try to jump at you. His remarkable face with his black mask and that unmistakable chirp meant love at first sight for everyone. And, he has a purr motor that never seems to quit! 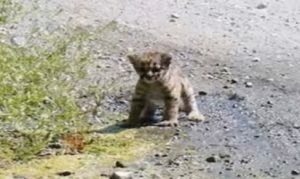 As soon as he was big enough, Andre was moved to a habitat right next to Donoma. They started chirping back and forth to each other and rubbing along their shared wall, so we knew they’d be best buds. Andre is about a year younger than Donoma, so he still had some growing up to do before they could live together. 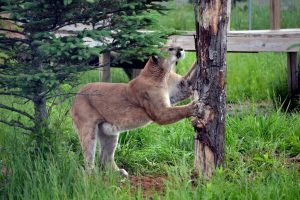 Andre learned a lot about being a cougar from Donoma, especially how to shred every tree in his habitat. 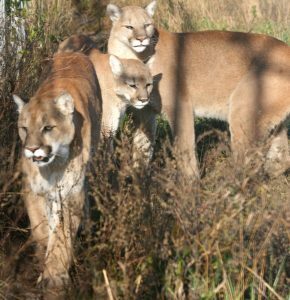 As the 20,000 square foot enclosure for the 5 cougars was being completed, the 3 cougar kittens from Wyoming were introduced to Andre. They moved next to Andre to get used to their new “brother.” Luckily, they’ve all gotten along so well together! Now, almost 8 years later, these cougars from different states – and even a different country – have all grown into strong, confident, cougar friends. Andre became the dominant leader of his blended family. Our first wish would have been for Donoma, Andre, Carlo, Noah, and sister Langley to have had the opportunity to grow up truly free. Thankfully, with the support of so many generous donors, they’re able to live out their lives wild at heart. Andre’s been featured in this Canadian fact brochure about cougars.